The use of laser in medical esthetic is gradually increasing together with the developments in laser technology. Many scars, sun spots and acne scars may be treated with carbon peeling applications performed through Q-Switch Nd-Yag laser. How is carbon peeling performed? The procedure begins with applying the specially-prepared carbon cream onto the skin as a thin layer. Carbon particles are sent into the skin pores with Nd -Yag laser after waited for approximately 10 min. These molecules are punctured in mili-seconds with another mode of the device. This procedure takes approximately 20 min. What happens in the skin at the end of the procedure? The carbon cream intensifies laser energy on skin surface. Increased energy induces collagen production. Large pores are rapidly closed. The procedure enables skin rejuvenation and shine through a peeling effect. How many sessions should carbon peeling take? The procedure should be applied in 5-10 sessions with 1-2 weeks of intervals. The effects begin after the first 2 sessions. When is carbon peeling done? 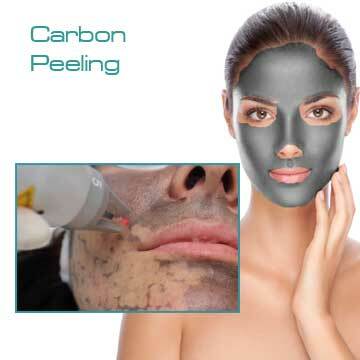 Carbon peeling may be applied at any time of the year, at every age and gender. It is a quite safe procedure which may be applied after all medical esthetic procedures. It should not be applied on nevi and potentially malignant lesions. To whom carbon peeling is performed? 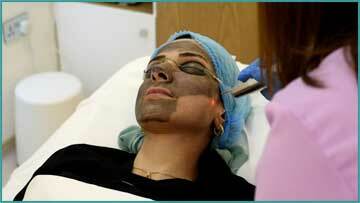 Carbon peeling is a successful procedure which may be applied at any age and any skin color. The patient does not feel pain during or after the procedure, general or local anesthesia is not required. The skin should be protected from sunlight after the procedure as in all laser procedures. How long carbon peeling procedure takes? The procedure takes 5-10 sessions with 1-2 weeks of intervals depending on the need of the patient. Skin firming and wrinkle correction begin to be seen in the first sessions. Recovery of acne and scars takes a longer time. Revitalization and firming which begin at the end of 10th session last 1.5-2 years. How safe is Q-Switched Nd YAG Laser? Our Q-Switched Nd YAG Laser device is FDA-approved. It may be used for also other body parts, mainly face. Carbon peeling may be applied at any time of the year and in any skin type. The procedure dies not negatively influence daily life as it does not lead to burn, redness and crusting. Patient comfort is maximum as Q-Switched Nd YAG Laser shoots strongly in nano-seconds and in only dermis. Carbon peeling may be applied after any procedures concerning face.